Zero Motorcycles came out swinging this year, with two new motorcycles and a whole suite of updated technologies. For the first time in my life, I can say that the want to ride an electric bike (that isn’t an electric super bike) is stroooooong. Before we jump into the new models, let’s take a look at the tech advancements Zero made to help make them awesome. The latest iteration of the Zero’s Z-Force IPM motor produces 130 percent more power and 150 percent more torque than other brushless motors used in similar applications, and is now capable of making 67 horsepower and 106 foot-pounds of torque. Zero focused on making this newest version better at sustaining high speeds and improving performance during harder riding applications by increasing the thermal capability of the motor. On top of that, it also cools more quickly, despite not needing any sort of liquid cooler or forced air cooling system. Zero claim to have improved their batteries for 2016, and with a 4 percent increase in capacity on the Zero S, Zero SR, Zero DS, and Zero DSR models, while the Zero FX and Zero FXR models get a 14 percent bump. This gives their bikes a range of 179 miles of city riding or 86 miles on the highway using the Power Tank Accessory, which adds an additional 2.8 kWh to any 2014 or later Power Pack. The batteries can also be swapped in less than a minute, so people looking to add range can take a second battery to the track or trails and swap them out as one gets low. Batteries can be charged on the bike or using an off-board charging accessory. Zero have a Charge Tank accessory, which they claim triples on board charging speeds, which brings charging time for the ZF9.8 battery down to about two hours, while the ZF13.0 will now take only three. The Charge Tank accessory will run you $1,998 but, considering that an hour of charge buys you 53 miles of range and costs next to nothing and that batteries can go 200,000 miles and still hold 80% of their initial charge capacity - it isn’t a terrible investment. The Zero DSR swaps the DS motor for Zero’s high output motor, which makes 25 percent more power at 67 horsepower and 56 percent more torque at 106 foot-pounds. It’s only available with the ZF13.0 battery, and comes at a $2,000 premium over the DS’s $13,995 price tag with an MSRP of $15,995. 106 foot-pounds of torque is a ton of power considering it’s all available from the jump, and Zero claim the DSR has a 0-60 time of 3.9 seconds. They bill the DSR as an adventure bike because of its larger size and semi-off road capabilities, but I have a hard time with anyone who puts electric motorcycle and adventure in the same sentence. You can see the full specs here. 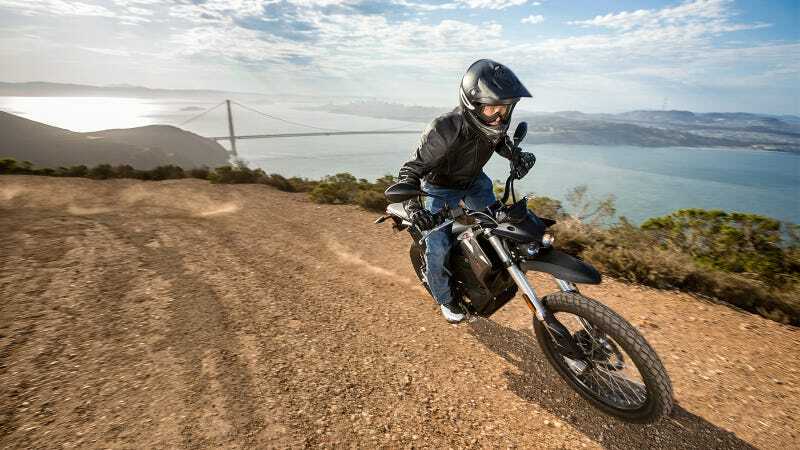 The Zero FXS is to the Zero FX as the Suzuki DR-Z400SM to the DR-Z400S. That is, it’s the supermoto version of their current dual sport. It keeps the same internals (44 horsepower and 70 foot-pounds of torque good for a combined 62 miles), but swaps the 18 inch rear and 21 inch front wheels for 17 inch wheels at both ends - both of which are wrapped in Pirelli Diablo Rosso rubber. Zero claim the suspension and brakes have also been bolstered for hooligan duty. The Zero FX already has a Bosch 9 ABS system on it, but the FXS bumps the 240 mm front rotor up to 320 mm which will provide more stopping power. Curb weight comes in at an incredible 293 pounds. The FX and FXS retail for $10,990 with the ZF6.5 motor, which is the only one worth buying (the ZF3.5 version only has a 34 mile range and limits horsepower to 27). You can see the full specs here. For reference, the Suzuki DR-Z400SM I love so much makes 32 horsepower, 24 foot-pounds of torque (which is not available across the rev range), has a 300 mm disc up front, and weighs 321 pounds. I can’t wait to take one of these and a spare battery to Socal Supermoto. I’ve gone on record several times as saying that I don’t really care much about these consumer-facing electronic motorcycle efforts. As with most things, I think it needs to start in racing and then trickle onto the street because the battery technology just isn’t there. Companies need to focus on applying electric power to two wheels and let Apple or Tesla or Microsoft solve the battery problem, and then use their fix. Additionally, new tech will always be pricey, so these poor-ranged bikes are always expensive, which makes getting the general public excited about them even more difficult. I’m also pretty skeptical about Zero’s mileage claims. All of the numbers listed are manufacturer claimed, but owners of the previous Zero DS report a range of about 80 miles. So, a 14 percent bump puts range for the new models at about 91 - a far cry from the claimed 134 combined mileage they claim. All of that said, the specs of Zero DSR with the Power Tank accessory (as long as you stop looking at them when it comes to price) are nothing short of incredible. Numbers like 67 horsepower, 106 foot-pounds of torque, a 403,000 mile battery life (to 80 percent), and a three hour charge time are a massive step in the right direction. As with most tech, price will hopefully continue to fall and put these more in the reach of more people, but it’s incredibly encouraging to see the performance start to be worth it.